The job search – a topic that still strikes fear into my heart. This is something that everyone in college will consider eventually. Let’s face it – the act of prostrating yourself before big bad employers is not the most comfortable. “Love me, please!” just about summed up my emotional state while sending out applications. What can make this transition from school to work less debilitating is having a plan. Here are three things to consider. The short answer: early. Most people entering their senior year have to decide whether they want to look now or wait, so it’s important to consider that it can take around five months or more from sending in your application to your first day on the job. The company has a period of accepting applications, then they hold interviews, then they get back with a decision, and finally you muck through the paperwork required and work out housing and moving to the job location. Of course, some of my friends applied straight to graduate school and therefore didn’t have to worry about the job cycle, but looking for jobs as backup to graduate studies is not the worst idea. To be employed immediately or almost immediately after graduation without taking some kind of vacation period, you need to start applying early. If you don’t secure a job in that time you can also apply after graduation, but I think it’s nice to have some experience job searching by then. Starting your applications early means preparation, because unlike with your college application essays (by which I mean my college application essays) you really need to spend more than a few torrid hours typing out a resume and cover letter. Resumes should be checked and double checked by friends, professors, or career center professionals, to rule out spelling errors or inexact wording. Online, there are different preformatted templates to help you with cover letters and resumes for each field, but don’t forget to have someone else look yours over before sending it out. 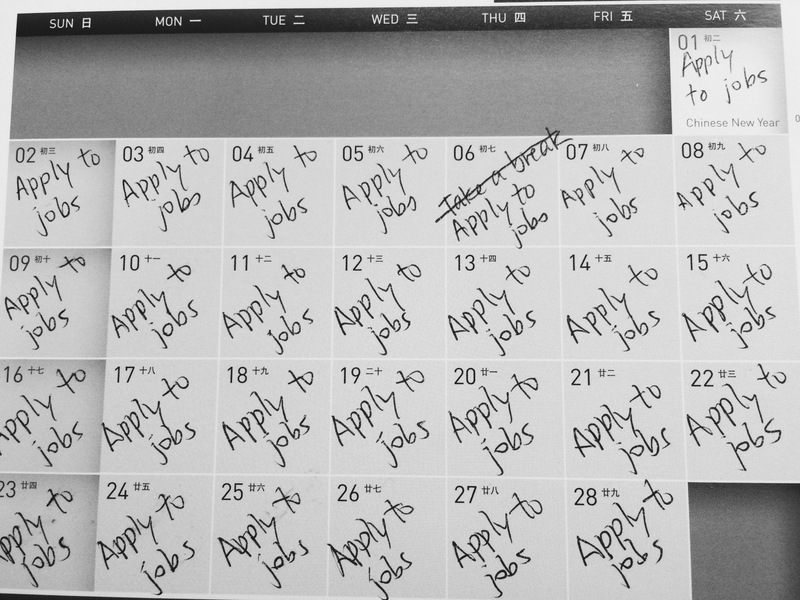 My friend Joyzel Acevedo ‘15 notes that, in art and film, “you cannot stop building your CV. Because if you do end up finding someone and they take a peek at your resume or CV to find out you haven’t done anything since graduation, then they’re put off from hiring you.” She also suggests applying for grants because securing a grant or winning an award stamps you with the validation that someone might hire you. Besides that resume-boosting mentality, if you love the art you’re creating, you should be creating as an ongoing process. Living to fill a resume is strange, but you can fill your resume with the best of what you’ve lived. Job hunting often means scouring job websites tailored to your field (in my case, ScienceCareers and Nature Jobs) as well as using any resources your college career center may offer. Chances are your career center will be brimming with resources, and if it isn’t helpful they need to hear from you that it isn’t helpful. While looking for jobs, I set up my internet browser so that each time I opened a window I produced a fan of tabs for different “Career Opportunities” and “Vacancies” webpages. To find those pages, do not hesitate to use Google as well as job databases. You should be searching for every job position and every employer you think you’d like to work with, because many jobs are unlisted. Besides the databases, career centers, and Google, you can also pore through your alumni network and professors to find connections. While mentioning a possible internship in the first email is rude, if you’ve started your job search early you can start off by actually getting to know them. This makes them feel less like they’re being attacked by a job-craving zombie and gives you a chance to find out if their work is really as interesting as it seems. There is a line between sounding motivated and sounding desperate, a thick or thin line depending on your point of view. If you’re not applying in a field where applications are standardized, you should try toeing that line. Write directly to the person hiring instead of using the database, to seem more personal. Call the office to express interest or inquire about when you’ll be hearing back (politely of course – do not call at five in the morning to harangue them with your application frustration). Above all, do not take rejection personally. Employers are looking for people to fill a specific position, not necessarily assemble a hierarchy of worthiness. I applied to one job at a prestigious university and thought it was a great opportunity working for a charismatic researcher until I met the lab members and found that they really just needed someone to oil the machinery: keep their spreadsheets straight and order essential lab supplies like coffee, or paraformaldehyde. While I was interested in a broad range of jobs, this was not one of them; being rejected from the position was easy to understand. Even if you esteem an employer or supervisor, taking a job means you will have to work in that role day to day; any side projects would be additional responsibility. Whether you’re considering a six month contract or two years subject to renewal, you want to be using your degree to get a job you actually want. With that in mind, know that most rejections you’ll receive arise when (a) another applicant possesses experience almost identical to the job description, which is something that you can’t help, or (b) the employer realizes you won’t be satisfied with the job. This just means you should keep looking, even if the job search seems like an actual job.